This is just a tiny, tiny word of caution to remember as we take in the Twitter feeds, YouTube videos and other user-generated content from Iran. First, although it’s invigorating to see the amount of info being passed on Twitter, I think there may be a quantity vs quality issue going on. I won’t go as far as Kara Swisher and call it the ‘Forrest Gump of International Relations’, but some of the tweets I’m seeing are…well…if not exactly Forrest Gump material, then maybe that of his long lost cousin who made it out of Savannah, Georgia before he did. Second, can what’s being tweeted or uploaded be trusted? Twitter has no system of checks and balances. Neither does YouTube or any other service. I could easily open up an account and tweet what I could call latest from Tehran, right here from my perch in Zurich, and no one would know. 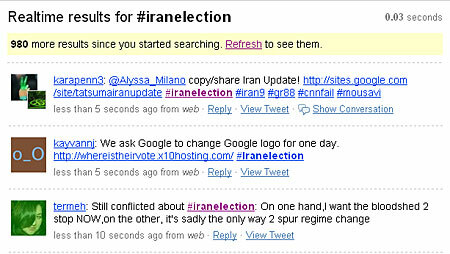 There’s already a watchlist of purported fake Iran election Tweeters making the rounds. The telegraph’s major role during the US Civil War is an example. Which leads me to my third point: It’s not Twitter, it’s the people. Social media tools are important, but they’re also the current hip tools of the day. The TV, radio and even the fax machine have also had an impact. It’s easy to get caught up in the sexiness of social media. When you blend it with vox populi, election intrigue and the battle to beat the 24-hour-news cycle, the results can be either orgasmic or cataclysmic.